Ivory, horn and blood: behind the elephant and rhinoceros poaching crisis. Rhinoceroses are being slaughtered throughout their ranges. The Vietnamese one-horned rhinoceros is extinct, the western black rhino is now believed to be extinct, and the northern white rhinoceros, the largest of them all, survives – only precariously – in captivity. 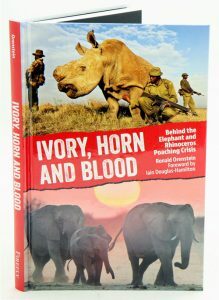 Since the worldwide ban on ivory trading was passed in 1989, author Ronald Orenstein has been at the heart of the fight. The ban came after a decade that saw half of Africa’s elephants slaughtered by poachers. After the ban, Africa’s elephants started to recover – but in 1997 the ban was partially relaxed, and in 2008 it was agreed that China could legally import ivory from four designated States in southern Africa. Today a new ivory crisis has arisen – this time, fuelled by internal wars in Africa and a growing market in the Far East. The situation, for both elephants and rhinos, is dire. This captivating book sketches out a crime story that, for most, is unseen and takes place thousands of miles away and in countries that few will visit. But like the trade in illegal drugs, the trade in elephant tusks and rhinoceros horns has far-reaching implications not only for two species of endangered animals but also for all of us who are ultimately touched by a world-wide underground economy whose pillars are organized crime, corruption and violence. Walking thunder: in the footsteps of the African elephant. Artist/Author: Christo, Cyril et al. One of the most majestic creatures on Earth, The African elephant faces an uncertain future. This book is a superb tribute to the remarkable beauty of these endangered animals. Striking duotone images by award-winning photographers Cyril Christo and Marie Wilkinson capture not only the formidable strength and size of the African elephant, but also its gentleness and human-like emotions. Accompanying the photographs are quotations, myths and stories from the past 400 years, from folklore and from explorers and tribal members, presenting both Western and indigenous perspectives. At once entrancing and thought-provoking, this is the perfect book for anyone passionate about the conservation of our planet. Artist/Author: Moss, Cynthia et al. 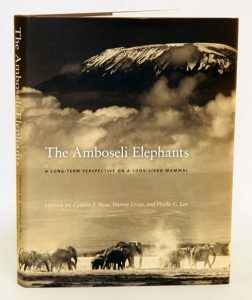 This book is the long-awaited summation of what has been learned from the Amboseli Elephant Research Project (AERP) – the longest continuously running elephant research project in the world. Cynthia J. Moss and Harvey Croze, the founders of the AERP, and Phyllis C. Lee, who has been closely involved with the project since 1982, compile more than three decades of uninterrupted study of over 2,500 individual elephants, from newborn calves to adult bulls to old matriarchs in their sixties. 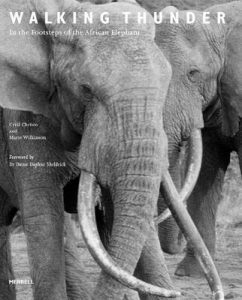 Chapters explore such topics as elephant ecosystems, genetics, communication, social behaviour, and reproduction, as well as exciting new developments from the study of elephant minds and cognition. The book closes with a view to the future, making important arguments for the ethical treatment of elephants and suggestions to aid in their conservation. 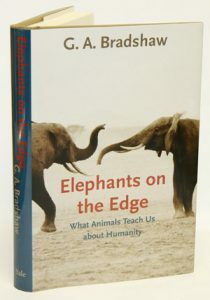 Drawing on accounts from India to Africa and California to Tennessee, and on research in neuroscience, psychology, and animal behaviour, G. A. Bradshaw explores the minds, emotions, and lives of elephants. Wars, starvation, mass culls, poaching, and habitat loss have reduced elephant numbers from more than ten million to a few hundred thousand, leaving orphans bereft of the elders who would normally mentor them. As a consequence, traumatized elephants have become aggressive against people, other animals, and even one another; their behaviour is comparable to that of humans who have experienced genocide, other types of violence, and social collapse. By exploring the elephant mind and experience in the wild and in captivity, Bradshaw bears witness to the breakdown of ancient elephant cultures. All is not lost. People are working to save elephants by rescuing orphaned infants and rehabilitating adult zoo and circus elephants, using the same principles psychologists apply in treating humans who have survived trauma. Bradshaw urges us to support these and other models of elephant recovery and to solve pressing social and environmental crises affecting all animals, human or not. 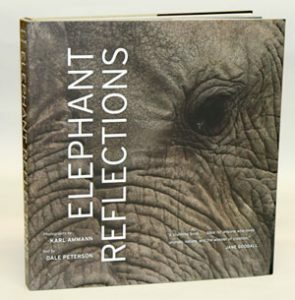 Elephant Reflections brings award-winning wildlife photographer Karl Ammann’s gorgeous images together with a revelatory text by writer Dale Peterson to illuminate one of nature’s greatest and most original works of art: the elephant. The photographs move from the purely aesthetic to the informative, depicting animals who are at once enigmatic, individual, mysterious, elusive, and iconic. In riveting prose, Peterson introduces the work of field scientists in Africa and explains their recent astonishing discoveries. He then explores the natural history and conservation status of African elephants and discusses the politics of ivory. Elephant Reflections is a book that could change the way the world thinks about elephants while we still have some measure of control over their fate. 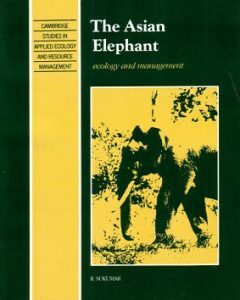 The Asian Elephant: ecology and management. 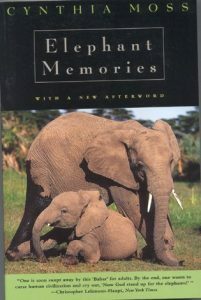 Elephant memories: thirteen years in the life of an elephant family. Cynthia Moss has studied the elephants in Kenya’s Amboseli National Park for over twenty-seven years and her long-term research has revealed much of what we now know about these complex and intelligent animals. Here she chronicles the lives of the members of the T families, led by matriarchs Teresia, Slit Ear, Torn Ear, Tania, and Tuskless.